And so it is that some thirty minutes later I see a group of some twenty athletes making their way to the track headed by a middle-aged man with a long distance runner’s gait and an endless torrent of jokes that keep the rest entertained: it is Gelindo Bordin, the man I am here to meet. Bordin is a true athletics legend. At the 1988 Seoul Olympics he won one of the most exciting marathons in the history of the event after overtaking Douglas Wakiihuri of Kenya and Ahmed Salah of Djibuti with just 1,000m to go to the finishing line. It was a masterful race where Bordin stuck fast to his tactics and belief to beat those who many thought were better athletes. Unsurprisingly that gold medal ranks as Bordin’s greatest memory along with his success in the Boston marathon in 1990. 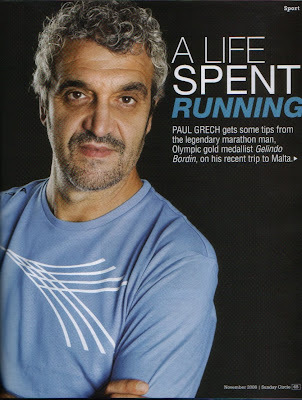 “Winning the Olympic marathon was a life-long dream,” he says. “But the Boston marathon was important because it confirmed the result that I had achieved two years earlier. There were some very good athletes in Boston and in 1989 I had missed a lot of races through injury so it was important for me to return to victory.” To this day, Bordin remains the only male athlete to have won both the Olympic and the Boston marathon. Talking about Bordin’s Olympic memories, conversation naturally turns to the memories of the fantastic event held in Beijing. Bordin agrees. “It was a beautiful edition,” – bellissima is the word he uses and it sounds much more appropriate - “Technically they were very good and the organization was spot on. China put a lot of effort, both financially and non, to ensure that these were a success and even though the weather wasn’t that good there were some exceptional results. It will be hard for anyone to repeat their success.” London 2012 has been warned. In athletics, the dominant figure was that of Usain Bolt, the young Jamaican so fast that he feels the compulsion to ease off towards the finishing line to let the rest of the field get close to him. It is, finally, a positive image for a sport that far too often has had to face the spectre of doping. That final comment might seem like a throw-away line but instead it is very relevant for Bordin. Having retired in 1994 there was no way that he was going to return to accountancy, the profession he had left at 24 in order to take up athletics professionally. Instead, he opted to stay in athletics working with the Italian company Diadora for whom he is today the company’s marketing director. “As long as after the race we go to swim,” he adds. I forget to mention that swimming in early March, when the marathon is traditionally held, perhaps wouldn’t be such a good idea. If that’s what it takes to get a gold medal winner to run in Malta, then so be it. This article was published in the November 2008 issue of Sunday Circle.